JOHNSON CITY, Tenn. – The State of Franklin Healthcare Associates Walk-In Clinic is making it even easier for patients to get call-ahead, walk-in medical care in the Tri-Cities. Starting September 1, the clinic will have expanded hours that run from 7 a.m. to 9 p.m. daily – even on weekends and most holidays. It closes its doors only at noon on Christmas Eve and on Christmas and Thanksgiving. On the other 362 days of the year, the facility will maintain its new 14-hour schedule. In 2013, the clinic became the first walk-in service to allow people to “call-ahead” before making a walk-in visit. People can still choose to just arrive and wait their turn, but those who call ahead and pre-register by phone have considerably shorter wait times. Operational since 2008, the SoFHA Walk-in Clinic is located at 301 Med Tech Parkway, Suite 110, in Johnson City; and has a rotating medical staff of three physicians, three nurse practitioners and fourteen nurses. The facility is one of 11 medical practices operated by the physician-owned State of Franklin Healthcare Associates. The clinic treats all ages and is open to anyone – not just to those regularly served at SoFHA medical practices. Also, it works with other SoFHA practices as needed to schedule some appointments – such as for elderly patients who may need time to arrange for transportation or general assistance in getting to and entering the clinic. Becky Lilly, who manages the walk-in service, says people love having the different options. 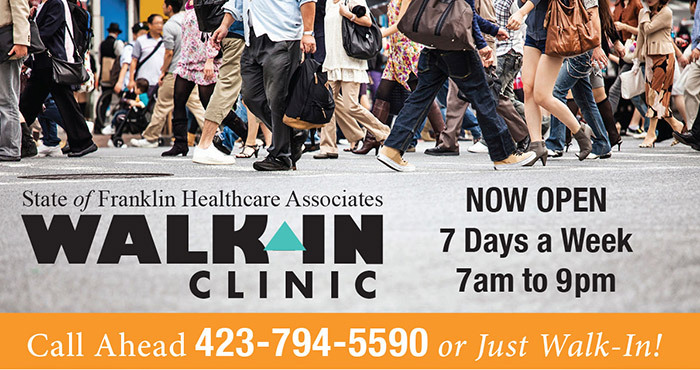 To make a “call-ahead walk-in” visit at the clinic, phone 423-794-5590. For more, go to sofhawalkin.net. People don’t have to be SoFHA patients to use the service.